I was recently on a website where franchisees can go to complain about there franchisors. The common theme amongst the complaints was that the franchisor made a lot of promises that they didn't keep, the numbers weren't adding up like the franchisor said they would and they weren't being trained properly. Of course, it's important to understand that when you buy a franchise, you'll need to wear a lot of hats! Not only are you the head of operations, but you will need to recruit the best employees and constantly train them, give customers great service, track the numbers and watch your expenses and keep your finger on the pulse of your business. There are lots of reasons that franchises fail. Running a business is not for the faint of heart. But if you bought into a franchise, you bought into a system or process that has succeeded at some level. So my suggestion is if your franchise is not performing like you want it to, make sure that you are following the system! Franchisees often get their business up and running and then begin to change or modify existing services, advertising, products and even the quality and consistency of the customer service that they are delivering. This not only can lead to poor franchise performance, but can unfortunately be a violation of the franchise agreement as well. Yikes! So long story short, you'll definitely want to be sure to follow the franchise system you invested in, as it's a proven model for success! 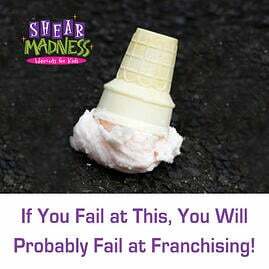 The Shear Madness Franchise Advantage! There are lots of moving parts to a franchise, including your franchisor's opening assistance, training and ongoing support. All of the aforementioned are important to your success as a franchisee, and the best way to measure these are to talk to current franchisees. As important as all these factors are, many people looking to buy a franchise fail to look at what is arguably the most important component of all: the customer. More specifically, how many customers are there for your concept where you want to open? Or, how many times will they come back in a given year, and how long can you hold on to them? This is called customer long term value, or CLV, and it can be the difference between your success or failure. Think about this, would you rather own a business where your customer comes back twice a year, or 8 times a year? Will they come back for the next 2 years, or the next 8? Will you be able to create a loyal customer or one that only needs your service once or twice per year? Customers are fickle! Make sure that you have lots of them in your trade area, and that the franchise you are looking at can hold on to them for a long time. I was floored recently when I talked to a friend of mine about the franchise she bought. You see this wasn't what I would call your "typical" franchisee. Jane (as I will call her for the sake of this blog) has been in the franchise consulting business for 25 years. She has trained and taught both franchisees and franchisors about what to look for in a franchise, how to run a successful franchise business and what makes franchisees successful. After years of consulting and teaching, Jane had decided about a year ago to buy into a franchise. Unfortunately, it failed after less than a year. With all of her expertise, all of her knowledge and all of her coaching, she forgot to ask herself one of the most important questions, "Can I see myself in this business?" People tend to look at franchises by how much money they can make and the cost of the franchise without ever stopping to look at what their day-to-day lives will look like. Most of us are creatures of habit. We pretty much follow the same daily routines like planning vacations in advance, or trying to schedule our lives the best we can. As humans we get into our "comfort zones". The problem is that when you become a franchise owner, your comfort zone becomes disrupted. That's what happened to Jane. She told me she was surprised at how hard it was to manage the people and how much time she spent working on her business. When Jane went from consulting to ownership, she experienced "where the rubber meets the road" if you will. Her comfort zone was disrupted, and the very things she had taught for 25 years she could't apply to herself. Now, try to picture what your day will look like in the franchise that you are considering. Call existing franchisees, as they are your best source and can give you an accurate assessment. And don't forget to ask yourself, "can I see myself in this business?" I recently attended a webinar with one of the largest franchising financing lenders in the United States. I would like to explain all the graphs that they showed us but the bottom line was this: all the signs point to the next recession hitting sometime in the next 24 months. Credit Card debt and margin buying of stocks are back to record levels. The small business optimism indicator is at record levels (this is a contrarian indicator). Retail rents are at extreme levels causing over building, even though demand is decreasing for retail space! But what I was most interested in was a chart of the top 15 franchises according to the SBA. I can't tell you those names, but what I can tell you is some commonalities they had. Four of the top 15 were child related. Most all were recession resistant. At Shear Madness Haircuts for Kids we feel like we combine both of these traits. As most parents look at a haircut as a necessity and not an option, and a haircut will never be replaced on the internet! Parents will always spend money on their children. They will cut out a lot of luxuries and services for themselves, but never a service that makes their children look better and feel better about themselves! I was recently looking through a research report about what types of people make the best franchisees. The answer may surprise you, although intelligence, business skill, and former experience as a business owner are highly valuable characteristics. However, the fact that you have an MBA did not get you to the top. Neither did the fact that you may have been a CEO of a fortune 500 company. Instead, the report listed Sales Executives as the top candidates to become successful franchisees. In a way Sales Executives are already small business owners. They believe in their product and have to go out everyday and sell it. In addition they understand that they are paid to produce, unlike people who have been on a salary their whole life. Sales Executives don't cower when times get tough. To anyone who has lived on commission you know the sales cycle can be brutal. However, you conquer these cycles by working harder when needed - always believing that things will get better. Most of all, Sales Executives relish the thought of unlimited earnings potential. It's what motivates them to get out of bed everyday. What the article failed to mention was one other thing that is consistent with all great franchise owners. Great franchisees understand that they are not in the product or service business, they are in the Relationship business. Building a relationship with your customers where they understand the purpose of your business, and building relationships with your employees so that they can deliver that good or service to those customers, is the key to great franchisee success! I recently met with a top-notch franchise consultant. He had developed a franchise system that he had built out and sold for a handy profit, hence his new business of being a "Franchise Consultant". Everyone wanted to know what his secret to success was. After two days of meetings with Bob (his name for the sake of this article) he finally told me the secret. As he was describing various franchisees, he told me about his best franchisee ever. "Our best franchisees did about 2.5 to 3 million per year, but we had one guy in Milwaukee who did almost 5 million!" What?! That's amazing! Of course, I wondered how in the world this guy in Milwaukee did it. I asked Bob about it, but it wasn't until 2 days later that he finally gave me the secret to this Milwaukee franchisees success. Bob simply said, "He worked harder then everyone else." Now don't get me wrong, there are a number of things that can account for franchise success. But what gets missed is that the individual in Milwaukee didn't just work harder then other franchisees - he made personal sacrifices that others weren't willing to make. Being the best requires more than hard work, it requires doing things that others aren't willing to do. In the book "Outliers", Malcolm Gladwell studies the great prodigies and people of genius throughout history. From Mozart to Bill Gates they all had one thing in common. They all practiced / studied over 10,000 hours. Were they bright and talented? Yes! But did they study and practice longer then everyone else? Yes! 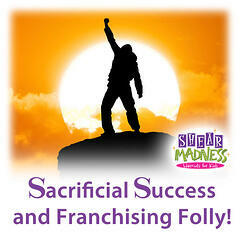 The real folly is thinking that if you buy into a franchise system, you'll be guaranteed success. However, while a franchise system will certainly provide you with a big advantage over going at it on your own, the simple truth is that you must still be willing to make personal sacrifices to make your franchise successful! 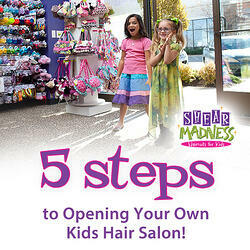 Shear Madness Franchising franchises Shear Madness Haircuts for Kids salons. We have worked with franchisees in providing excellent support and service (in order to encourage continual growth and franchise success), and have sometimes seen the unexpected happen! When it does, we help by identifying and helping with challenges that might arise for franchisees. Additionally, we work to present options that can help prevent these events as well. Having a knowledgable support base who can help guide and advise you through your business journey is a significant advantage of franchise ownership! Tips on Becoming a Multi-Unit Franchisee! Ask almost anyone who has opened their own franchise business, and they'll tell you that success rarely happens overnight! Building your store into a thriving business sometimes takes a healthy financial commitment, as well as patience, perseverance and of course - hard work! But after you've opened your first store, should you consider opening another? What about three or four? Or 25? In the world of franchising, with hard work and setting goals, you can achieve these dreams. But understandably, you have to make sure you don't bite off more than you can chew! While many franchisees may be perfectly happy with achieving success through opening one franchise location, opening multiple units requires certain abilities which may catch some people by surprise. For example, a franchisee will find that it's a completely different ball game managing multiple units. It's not like it was when they only had one store to worry about! Now, with many moving parts and employees to manage, a franchisee will need to step into a role more like that of a CEO (with managers, human resources and accounting staff to help grow the business). In other words, it'll be a lot more difficult and stressful to try to micro-manage every detail when multiple units are owned. This is where hiring the right people and trusting them to help you grow with multiple units is extremely important when pursuing this path. And sure, under a multi-unit model your employees might not do it exactly the way you would have done it, but as long as it's delivering the results, don't sweat it. If you can get an employee to do it 80% of the way you would have - you have a great employee! Additionally, a franchisee considering opening another store should make sure that they're not just falling prey to a "bigger is better" mentality. Because if a franchisee has opened 4 locations and 2 are losing money, it may end up being less profitable than having one or two stores that they're much more able to capably manage and grow - and ultimately make even more money than they would have made with 4 locations. Without the right systems in place for multi-unit ownership, it can become really difficult for one person to manage the growth of numerous locations, and the great customer service or experience that was once provided with just one or two stores might be an unfortunate casualty. Location is another factor to consider when owning multiple units. Of course establishing a business in the right area to maximize profits is always key. But it's also good to be aware that the farther apart your franchise locations are from each other, the more challenging it might become to manage properly. Not only that, but distance might impact how much shipping or delivery of retail from your warehouse costs, which could cut into profit margins as well. And then there's those unexpected emergencies that might happen when you own more than one store. For example, what happens if one of the stores you've opened is located in a great area, but road construction for several months impacts the flow of customers? Because of this, it's sometimes a good idea to make sure that you have multiple ways to support the business in case of those scenarios that temporarily causes a dip in your profits. To illustrate this concept, consider a business owner who owns several book stores. In order to diversify incomes for unexpected financial situations, this owner also sells books online, hosts school book fairs, and perhaps works as a small publisher for local authors. In the end, there's sure to be a lot of other valuable decisions to think about before investing the time, energy and monetary resources into multi-unit development. But with careful research, networking with other multiunit franchisees, and attending workshops or conferences, those business owners interested in the potential that this exciting avenue of franchising represents will be better equipped for whatever comes down the road!